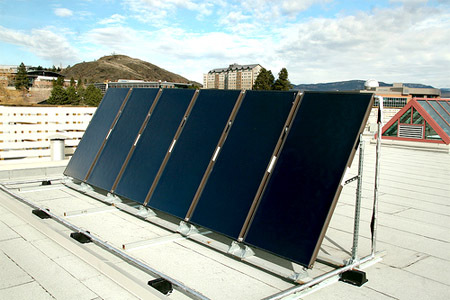 The average payback time for a standard-sized solar power system (5kW) is about 7 years. Albany energy rates are a pretty cheap $0.12/kWh. If you installed a 5kW system you would save approx. $708 per year on your electricity bill ($59/month). The rebate program in the state of New York is highly rated. For each kW of solar energy installed the state gives back $1750; calculated up to a total of 40% or $12500, whichever is the lesser. On average a typical 5kW system will result in a total refund back of $8750. Also, it is often possible to find a solar installer able to deduct the rebate off the actual set-up cost. Besides the highly rated rebate, residents in the state of New York also get a sizeable tax credit at 25% of installation costs up to a total figure of $5000. Incentives in total (tax rebate and credit combined) from the state can reach an exceptional 65% or $17500. Latest estimates reveal that the installation of a solar energy system will add approx. 20x the cost of your electricity bill to the value of a property. And with the good will of the Albany tax authorities that increased value is 100% tax exempt. Still better, a solar energy installation is also 100% exempt from sales tax. The Renewable Portfolio Standard (RPS) developed in the state of New York is of strong standing but isn’t seen as exceptional due to its ambition of only achieving 22.5% renewable energy by the year 2020. While that might be commendable for sure, in some states the bar is set much higher, such as the state of Colorado aiming for 30% by the year 2020, and the state of California aiming for 33% by the 2020. Cities in New York will need to up their energy production if wishing to keep up elsewhere. Net metering, which refers to the credit given back to customers for using less energy than the solar panels produce, is available in the state of New York although there is no guarantee of being able to use this incentive. Presently a 1% net-metering limit is in force for customers per grid, so if too many customers attempt to claim this incentive you might well be out of luck. If this incentive was increased to a more workable 5%, than local residential customers would have a much higher chance of benefiting.